Kelly's Korner: Everything tastes better FRIED! This weekend, Scott, Harper and I headed down to South Arkansas to visit Scott's family. We left a little early on Friday so we got to Russelleville just in time for dinner which I was excited about because I wanted to eat at Whatta-burger. (Not the chain - this is an old family restaurant right across from Arkansas Tech University). We ate there last time we went to Magnolia with Laurie and Steve. But what I found out on this trip is that they have FRIED PIES!!!! These ladies in my parents church used to make the best fried chocolate pies when we would have church potlucks and this preacher's daughter would knock everyone down to get first in line to get one. I saved the pie for when we got back in the car and I wish I had known how good it was going to be or I would have bought more. OH MY it was good!!!! We got to Magnolia Friday night just in time for homemade ice cream - does the eating ever stop? Saturday morning we got up and got ready and after Harper took a morning nap - Scott's mom and I headed to the town square to shop while Scott and his dad worked at the deer camp. This cute children's store (Sara's) was having a 50% off sale and Judy bought Harper these two PRECIOUS outfits for when she gets to be 3 or 4! I can't imagine what she will be like at that age! We had her down for an afternoon nap and I peeked and this is what I saw! 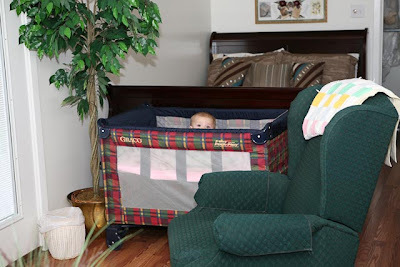 Can you see that little head peeking over the edge of the crib? She was in no mood for a nap! Oh - that little girl! Can you tell she is a little doted on? The catfish place is out of town at a lake - it's really pretty! We came home and got her ready for bed. Harper was enjoying having the attention of all 4 of us! She was wound up before bed time. I love this sweet picture of her cuddling with her grandpa! She is just the sweetest thing! Scott's mom is the best gardener. She definitely has a green thumb. I feel bad because Scott married a black thumb. I have no interest or talent with plants. Scott took their picture this morning in front of these huge flowers she has grown (she would have to tell you the name but they only open at night and briefly in the morning). Love the pics!! Harper is gorgeous and I pray for her every night. I show my babygirl her pictures on the computer and she smiles and kisses the screen- so funny! Glad you had a good family weekend, love to hear about it! I have a feeling the only thing sweeter than a chocolate pie is the smiling cutie in all these awesome pics! Glad ya'll had a great weekend, my friend! Harper looks so happy!! What a happy little girl you have! I bet those fried pies are yummy. Glad you had a great weekend, it's always good to catch up with the grandparents! My husband works at Arkansas Tech, so needless to say, we spend alot of time having lunch dates at Whattta-burger! Everything there is wonderful! Their chocolate milkshakes are out of this world!!! Glad you had a good trip!!! Oh soooo yummy! Makes me crave some chocolate pie! Harper is such a cutie pie! 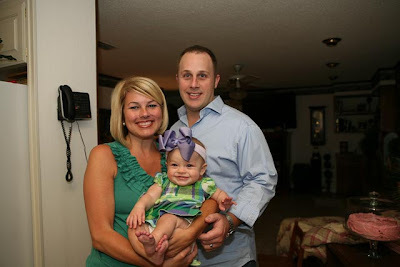 When Harper was little was she ever on medication for her acid reflux? My 2 month old son has bad acid reflux and he's on prevacid however he spits up most of the medicine and is still fussy during and after feeding plus spits up tons! Just curious! Oh, how I love the REAL Whatta-Burger!! Yum - hope you had a chocolate shake, too. I don't think they had the fried pies last time I was there but that was probably 15 years ago!! Love the pic of Harper peeking over the top of the pack-n-play! Too cute! Oh, the goodness of that fried pie. I can't imagine! 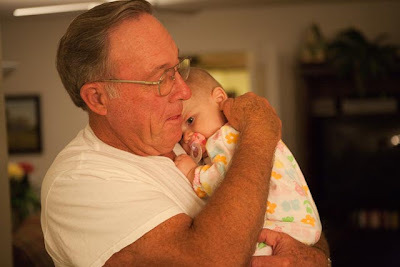 I love the picture of Harper & her Grandaddy - I think she's thinking "If I stick with him, I won't have to go to sleep". Everything is better fried! My husband and I were in Atlanta this weekend and went to a Braves game and they had fried oreos and twix bars! They were Awesome! OH MY HEAD but she is adorable :-) I love all her outfits! And you are SO right, everything really is better fried! The flowers look like (and sound like from what you said) morning glories!! They are beautiful & you aren't the only one with black thumb...so no need to feel bad!!! Ha Ha! Diet tomorrow? Does that mean you ate all the pie tonight? LOL Yum Yum. Hi Kelly, I've been following your blog for awhile now but this is my first comment. I think Harper is the most precious baby girl I've ever seen! I've showed her pictures to my husband and informed him that if we have a little girl one day, I hope she looks as sweet as Harper. Anyway...where are your ruffled shirts from? I love them both! I have never had a fried pie, but that sound delicious. I will have to try it sometime. Harper is adorable! Sounds like a great weekend! Harper is a doll as usual and the pie sounds wonderful! Oh my word!! I love whattaburger!! I am from Russellville and fill very lucky to have such great places to eat in our town. I'm going to have to try a fried pie next time I eat there. Oh Kelly I am wanting a chocolate fried pie so bad right now!!!!!! That just sounds so great. There's a little restaurant in Huntsville that has fried chocolate pies. I've never had one by one of my former coworkers loved them. This place is pretty good. It's called Granny's. Everyday they have a different special. We would usually go on Fried Chicken day. You could get 3 huge pieces of fried chicken and two sides for $5. It was amazing. Mmmmm, Whatta Burger! One of the places I miss, along with Taco Villa in Russeville! Granted I'm only in Conway so it's only a 45 min drive. 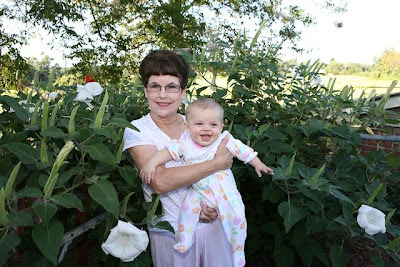 I love the pictures with Harper and her grandparents:) I think that the flower is called Moonflower...my mother-in-law had these in her garden. I'm glad you had a great family weekend with your in-laws...I did too! Don't you just love spending time with family!? Girl, you got it right with those fried foods!! You and your family look beautiful as always! I'm glad you guys had fun in Magnolia!! Sara's has the cutest kids clothes!! You came through my town on the way to Magnolia. We live in Russellvile and love Whattaburger! Russellville is my hometown - my parents and inlaws still live there...never had the fried pies but the banana milkshakes used to be really good! Have not had one in several years though! Maybe I can give the pies a taste when we go home at Thanksgiving. I have never heard of a Fried Chocolate pie! Sounds yummy though! I love the little outfits that you bought for Harper! And my London has that same little doll. She loves on that thing everyday. Glad you had a fun trip! The pic of Harper cuddling with Scott's dad is just precious! I can see that one making it's way into a slideshow for her high school graduation! I'm pretty sure I've never had a fried chocolate pie. But I'd at least be willing to try one! Those flowers are beautiful! 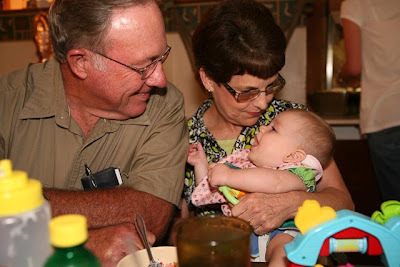 And looks like she enjoyed her grandparents a lot! Those are sweet sweet pictures of them together! And Fried Pies are the best! Precious pics! looks and sounded like you guys had a great weekend! I L.O.V.E. Whata-Burger! We stopped every trip we took past Russelleville! I miss those trips :( I had a college boyfrind who was from Magnolia but I never visited. I'm pretty sure I'm better off never knowing what a fried pie tastes like. You can't miss what you've never had, right! Miss Harper is cute as ever!! I've driven from Little Rock to Russelleville, just to eat at that Whatta-burger! So yummy! I loove the picture of Harper peeking out of the Pack and Play. So cute! That gray shirt you have in in the first picture is really cute. The picture of Harper in the pack and play is so cute! You are right it doesn't look like she wanted to take a nap. She is just SO cute! Love those outfits. Oh how I miss Whattaburger in Russelleville. I lived on it when I was at Tech. LOVED IT. So funny that your hubby was working in the deer woods, because my husband, father in law, stepfather, and stepbrother were all doing the same thing this weekend :) It must be this unseasonably cool "fall like weather". I am loving it. I can't wait to be calling the Hogs! What a fun weekend- and Harper is a cutie! Harper is such a gorgeous little girl! 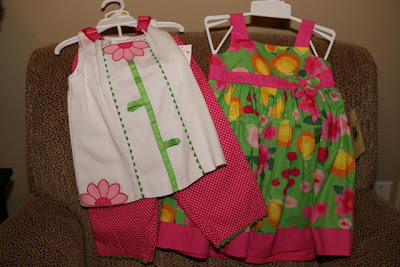 Those outfits are precious, I love dressing my 4 year old in sweet clothes like those! My mom makes a delicious chocolate pie, but I've never had a fried one, sounds yummy!! I'm fairly certain that those flowers are Moon flowers (http://www.landcraftenvironment.com/mm5/merchant.mvc?Screen=PROD&Store_Code=LANDCRAFT&Product_Code=IPOM-MF2&Category_Code=0888), my Grandmother used to grow them. They were my favorite flowers of hers that she grew. I wish I has inherited her green thumb. Sounds like a FUN trip...always good to go see Grammy and Papa!! Those fried pies sound good. Is the inside like chocolate pudding, or more like a candy? You should post your take on that b/c us "northerners" don't know what those are all about! 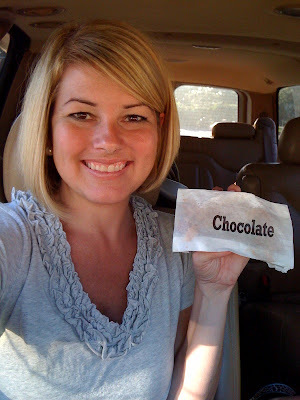 My word verification is: lawdy...just what I was thinking when I was reading about the Chocolate Fried Pies!! Ha! I LOVE seeing pix of Harper. She is so pretty! Sounds like you all had a fun trip. It is so important to hook up with parents/grandparents and to keep those ties strong. 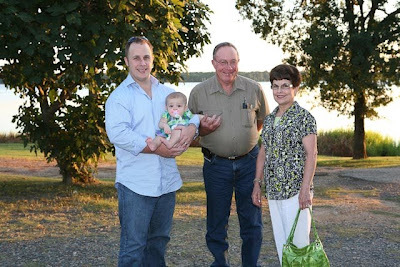 The pictures with Harper's grandma and grandpa were so sweet. And I am sure they love their pretty daughter in law,...who is such a warm and beautiful person. Ooh, Harper is SO adorable in those pictures! I love the one where she's peeking over the play pen! Feltner's Whatta-Burger in Russellville is AWESOME!!! Love it!!! What a GREAT weekend! Harper is such a beautiful baby! What a blessing! I saw you mentioned WHATABURGER! but it wasn't the chain. I am from Texas and Whataburger is the best!!!! Ooh, I want some fried pies!! I love the title of your post. 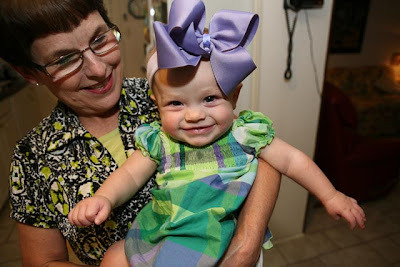 :) How precious is Harper in that purple/green outfit with the big purple bow?? Love it!! Glad you had a good trip. MMMM, fried CHOCOLATE pies! Haven't had one in YEARS. Is Harper pulling up now?? That is the same pack and play I have :) Got it with Abigail and the only reason I didn't get rid of it after Isaac is b/c we had it at my mom's and just left it there. It was the ONE big item I had when Elijah was born. The rest were gone. Girl~ Fried chocolate pies.. I do not blame you!!! Harpers new outfits are just too cute! Oh, were did you get that cute gray shirt you had on? It looks like a cute tshirt to wear to just about anything?? Glad y'all had such a great weekend and have a blessed week! I cannot begin to tell you how many chocolate SHAKES I have had at the Russellville Whattaburger, but never, ever a chocolate pie. I am seriously homesick (and hungry!) now! I looooooooove hushpuppies! Definitely one of my favorite sides. HI Kelly, What a great weekend.The fried pie sounds wonderful. You will have to experiment and make up your own recipe and pass it along. Chocolate + fried.. how bad can it be? Harper is adorable in her purple and green. One of her cutest outfits. And speaking of cutest, the pic of her cuddling with grandpa is adorable. I'm sure that one will be on the frig. It looks like you had a really nice weekend! Don't feel bad-I have a black thumb, too. I have no interest in gardening! Ohhhh! Feltner's Whattaburger? That place is awesome! Too bad I only get to go there twice a year when I visit my in-laws in Fort Smith, LOL. I have kept up with your blog since just before your baby was born. It's been a blessing. My husband and I have been married for 28 years with one daughter who is 23 now and going to college. I so remember all of what you are going through. I'm in love with Harper! ha! Just love her and if she doesn't want to take a nap love her. They leave so quickly. Then you have to track them down. Love her even if she doesn't want to take a nap. Harper is so stinkin' adorable! She is at such a fun age! I love that age when they're just getting strong enough to sit up alone and are just chatty and smiley all the time. You're blessed beyond measure with such an adorable baby girl!! Super cute pics! Please tell us where you got the adorable ruffle tee you're wearing in the top pic-I LOVE IT! The picture of the three of you in your coordinating colors is 2 cute! What is fried pie?? I live in NC and thought I had heard of all things fried!!! How did you find out that Harper is allergic to fried fish??? Harper has the cutest little smile! oh my...I have never had a fried pie! Have you had fried ribs?? Makes my mouth water just thinking about them! There is a sweet lady here in TN that makes fried pies for our picnics. I have begged her to pass on her secrets, but no luck yet. Harper's allergic to fish? I am also, and by the time I was 3 or so I could not even go to a fried fish joint, a fish fry or even in the school cafeteria when they had fish sticks. My eyes would start buldging out and turn blood shot red. Not fun! I still avoid all things fish! and love the j.crew ruffle tee in the first picture. i have that exact tee in that color and have worn it out this summer. love it! True indeed! Everything does taste better fried! If you ever come to Atlanta, you need to eat at the Varsity, they have yummy fried pies too! fried, chocolate, frosting, gravy, cheese...if you and any (obviously not all at the same time, LOL) of these things,food will instantly taste better! Yummy, I love food! Harper is so precious! That smile just melts your heart, I know. 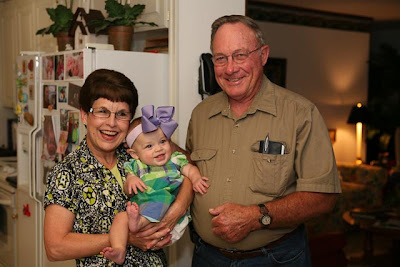 The picture with her Granddaddy will be a timeless treasure. What a great shot! Glad y'all had a great weekend. Oh I'm with you! I had never had hushpuppies or fried pies before I moved here and I think I need to make up for all that lost time! Harper is so cute! Glad you all had fun on your trip. Cute photo of her peeking out of the pack n play. Is she in the bassinet part still? The weight limit on that is 15 lbs or when they can push up on hands and knees. For safety's sake, might be time to move the mattress to the bottom. OK, many of us have to know where you got that AWESOME TOP in the pic of you with the delicious fried pie?!?!?!?! The fried pies sound delish, but what the heck is a hushpuppy??? I'm a northern so it should come as no surprise I guess that I don't know. Looks like a very fun time was had my all. Nothing better than fried catfish from South Arkansas. I grew up in Camden, and love Woods Place. Love me some Whatta-Burger in Russelville! I will have to try the fried pies next time I'm driving from Memphis to Fort Smith! And I LOVE the Square in Magnolia, especially drooling over everything at Murphys! Fried pies are the best. My favorite are my Granny's fried blueberry and apple pies!!!! YUM!! Also, I was wondering how you do already know that Harper is allergic to fish? Girl... that Wha-ta-burger is THE BEST! I've eaten there several times in my life. My husband's family is from Cabot so we make many many trips through Russellville every year! All things are definitely better fried. Fried chocolate pies are about as close to heaven as one can find here in GA. They are super delish! Fried Oreos are just as fab, and I use them to wash down fried broccoli and green beans. Mmmm mmmm! Those flowers seem to be Morning Glorys. Those pies sound delicious and as usual, Harper is adorable! Glad to hear you all had a great time! yumm.. i want a fried chocolate pie..glad Harper is such a great traveler for ya'll.. what a blessing! If you want a cheater recipe in a pinch, I have been making these for a long time. They aren't exactly the same, but they're good when you need a fix! I'll be praying for you and Harper. It's difficult not to be concerned it's your baby girl. Love reading your blog, your just darling. Mmmm, fried pies! We had a church fish fry last night complete with peach fried pies. I prefer chocolate myself but obviously did not pass up a peach one. Harpers such a doll! God bless. Great pictures of all of you. Glad you had a great trip, Harper looks so cute in all the pics.. Love the purple bow! Yum, I am drooling just reading your post. I had to tell you that the Cleveland area is FINALLY getting a Sonic!!!! It's on the west side of Cleveland and we live on the east unfortunately but it's at least in driving distance and near my parents. I am going to have to check this out and grab a Vanilla coke in your honor. Glad to hear you had a great weekend. Fried pie!! that sounds delicious!! Harper is getting so big and she is so stinking cute!!! Directions: Mix cereal, sugar and cinnamon. Divide equally between 2 pi plates or othe shllow containers. at eggs wth water in another pie plate or shallow bol. Cut pound ake into bite-sized square pieces. Press each square in cereal mixture an press coating into cake. Dig coated square in eg wash,ten roll in second container of cereal mixtur. Again press coating onto cake. just a little suggestion...i think you might want to lower the mattress on the pack n play- since she is 7 months, she could start pulling up at anytime..and if they can stand and there chest is higher than the side of the crib/pack n play it needs to be lowered...just don't want her getting hurt. The flower loooks like it came from a moom flower , smell is very sweet and easy to grow from the seeds they leave behind, Harper is so cute peeking out. Oh Kelly... I totally understand about the fried pies... I live in Russellville and eat there OFTEN! It's SO yummy! Harper is adorable as usual! Harper has to be the cutest little girl in the world. That little face is too much :) The pic of her with Scott's Dad is the best, you should frame it for Grandparents day for him. Sidenote, I received the Singles book and I can't thank you enough. I know somewhere my prince is out there, but my King is right by my side. Thanks for the inspiration and encouragement!!!! Harper is absolutely beautiful!! And, you must tell us where you got your grey shirt! Too cute! I love hushpuppies! Havent had them in SO long. Oh and fried chocolate pie... girl you are giving me all kinds of cravings for things we dont even have out here in the west! It is great that you ate at Whatta Burger...it is the Russellville staple for sure. However the grandson's of Mr. Feltner are actually opening a resturant in NWA so who knows you might get some great fried pies up that direction pretty shortly. I LOVE RUSSELLVILLE and think it has wonderful things to offer. Hey girl! What was that catfish restaurant that you went to close to Magnolia? I swear I used to eat there as a kid when I would visit my grandpa in Magnolia. He catfish AT LEAST twice a week...it was his fav...have you ever eaten at Between the Creeks? My husband tells me I have a black thumb, too! I am glad I am not alone! Harper is the cutest thing! mmmm, Whataburger! We used to stop there on our Fayetteville-LR trips for a snack or a shake. My hubby's grandmother used to make him fried pies for an after school snack--he was a chubby boy in those days. My husband and I made fried chocolate pies today. Boy! They are wonderful. We had never heard of them. We eat fried apple pies all the time. Thanks for letting us know about this wonderful treat. I went on search to get the recipe. You must have been in Dardanelle --@ the Catfish Inn. I love their hushpuppies -- my family lives down there (such as Whitney who wrote the note above). However, I live in MN so what fried pies are you talking about -- where are they from? Oh my goodness, did you get those pies in Prescott, Arkansas??? My husbands aunt & uncle own a pie company there & sell pies that look just like that!! !